Little kids love stories about monsters. They love pictures of monsters and playing monster games. But if the average kid was to see a monster? Not so much. So Intruders attempts once again to make the objects of childhood nightmares scary for adults. With limited success. You see the monster that dwells in your closet and lurks near your windows is called Hollowface, a nearly invisible cloaked apparition without a face. As a result he feels unloved and jealous of all children, at least ones with facial features. The story tells two stories simultaneously, one set in Spain featuring a young boy and his single mother, and the other in England featuring John (Clive Owen) and his family, wife Sue and 12 year old daughter Mia. It is the kids that get the unwelcome attention of Hollowface, almost always in the dead of night. Hollowface proves brazen and bold, but this results in exactly one tense scene in the entire film, and even that scene is called off early in favour of a clumsy fight sequence. With two stories running parallel and a couple of flashback scenes returning intermittently it grew hard to even try to let my inner child get nervous let alone scared. I was too busy being confused. The ending tried to bring everything together but by this time the damage had been done. 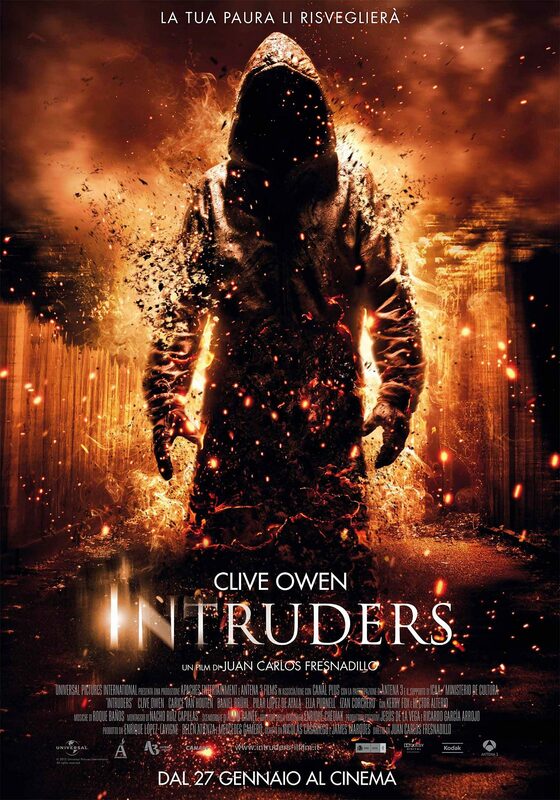 Intruders is not a bad film and has a couple of intriguing elements, but it is not at all scary and the decent cast is wasted with some sloppy direction. Final Rating – 6 / 10. 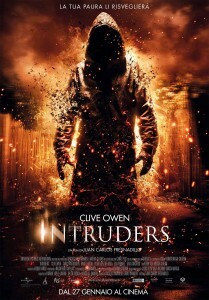 Intruders is a semi-decent ending in search of a semi-decent first 80 minutes.